Maybe you have some old computer monitors laying around the house? Perhaps there are some useless TVs sitting out in your shed? If so, you might want to dispose of them in some way. What you might be surprised to learn is that these items can actually be recycled. Known as E-scrap, they contain a variety of different metal components which can be melted down and used again. Wanting to learn a little about recycling such materials? Here are the basics of recycling E-scrap. What E-Scrap Can Be Recycled? E-scrap comes in many different forms. While not all electronic items can be recycled, a great many of them can. Let’s discuss the types of e-scrap which can be recycled. Essentially all types of computers and computer accessories can be recycled. Whether you’ve got a monitor, a hard drive, a laptop, a printer, or otherwise, as long as it’s associated with computers, it can more than likely be recycled. Often times, when people are finished with batteries, they just throw them in the trash. What these people may not realize is that throwing batteries in the trash can actually be detrimental to the environment. Instead, it’s highly encouraged that you have them recycled. You’re almost sure to have an old cell phone sitting around the house. If so, instead of chucking it in the trash can, you should consider recycling it. Recycling centers around the world are able to take the metal components within cell phones, melt them down, and reuse them for other purposes. Have an old TV that doesn’t get the job done anymore? If so, you might want to consider recycling it. The metal components within your tv can either be reused or melted down and formed to make new products. The fact of the matter is that some light bulbs are dangerous to dispose of in the trash. They contain mercury which can be truly detrimental to the environment. Fortunately, they contain a number of different metal components which can be recycled. Recycling your e-scrap is beneficial in a number of different ways. By doing so, you’ll see environmental benefits, economic benefits, and financial benefits. Want to help cut down on total carbon emissions in the world? If so, you need to consider recycling your e-scrap. It requires far fewer fossil fuels to recycle metal than it does to mine fresh metal ore.
Want to help create jobs in the United States? Want the United States economy to be as strong as possible? E-scrap recycling is big business in this country. It not only creates hundreds of thousands of jobs, it contributes billions of dollars to the United States economy on a yearly basis. Would you rather pay more for products, or less for products? We already know the answer. Who would ever want to pay more? Well, by recycling your e-scrap, you make the manufacturing process cheaper. What does this mean? This means that you won’t have to pay as much for the products you want and need. Looking to Recycle E-Scrap in Chicago? Have unusable electronic items you’re hoping to get off your hands? Looking to recycle E-scrap in Chicago? If so, we here at Central Metal Recycling are the people to see. 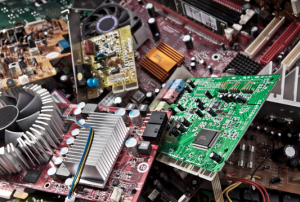 Our seasoned team of metal recycling specialists is well-versed in the recycling of E-scrap. If you’re looking to dispose of any of the electronic objects reviewed above, we can help you.